I am very excited to share my 4th module “Sitecore Social Feeds Manager” on Sitecore marketplace. You can download it from here. We all know the importance of social media for product branding. Almost all websites showing their organization or products related social messages to their website. I created this helix-based module for getting social feeds from Facebook, Twitter, Youtube and Instagram. 2. 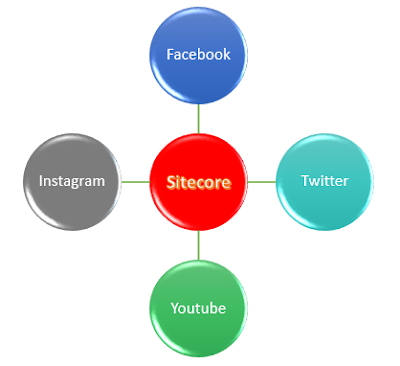 Fill your Social keys for Facebook, Twitter and Youtube in item "/sitecore/content/Habitat/Global/Social/Social Media Manager"
4. Access JSON result from URL http://<your.sitecore.instance>/api/sitecore/social/GetSocialFeeds?channelName=youtube&token=accesstoken. By default, it shows recent 8 feeds from each social channel but you can control the number of feeds from Sitecore. I also included “All” feeds option where you can access recent 2 feeds from each channel and show mix of total 8 feeds on your front end. Again, you can control total numbers of feeds from Sitecore for “All” use case. I have excluded HTML part on this module as every website have different HTML and look and feel. So directly consume this JSON output and integrate it in your HTML at desired location. "From :" + field.From + "<br><br><br>" + "</li>"
I hope you will use these Sitecore modules. Stay tuned for more Sitecore related information. Please leave your comments or share these marketplace modules if it’s useful for you.